Carpet typically takes between four to eight hours to dry completely, however, it could potentially take even longer than that. It’s important that for at least the first two to four hours, all feet stay off the carpet. Walking around on a newly cleaned carpet will increase the amount of time it takes for the carpet to dry, so make sure to keep your kids, and everyone for that matter, away for as long as possible. If someone does have to go onto the carpet for any reason right after it has been cleaned, just make sure they’re wearing clean, white socks! Damp carpet is more likely to pick up dirt from the soles of shoes. You will want to make sure to tell your kids that if they do need to be on the carpet at all after it has been cleaned, they should go barefoot or with only socks on. This is especially important if the soles of their shoes are a dark color, as it’s more likely that these will leave dirt tracks behind. If you’re walking around on carpet that’s still damp, it can be very slippery. 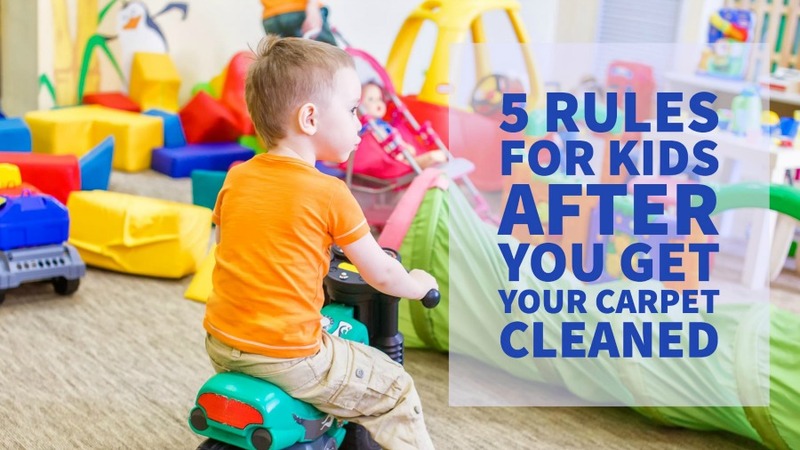 Make sure to tell your kids that they aren’t allowed to run around on the carpet for about six hours after you’ve had your carpets cleaned. They should be especially careful when walking down the stairs, as they don’t want to slip and fall. If anyone is wearing shoes on carpet that is still even a little damp, they should also be very careful when walking into other rooms around the house, as they could slip on any hard surfaces. If someone accidentally spills on the newly cleaned carpet or it gets dirty in any way, make sure the kids know to tell mom and dad as soon as possible. It’s always best to take care of any dirt or spills as soon as they happen, so this is a rule that should always be in place. You should not move furniture back into the area you’ve had cleaned until the carpet is completely dry, typically for around 24 hours. While kids may want to hang out in the area (especially if it’s the playroom or TV room that has been cleaned), remind them that they can’t bring any furniture with them and will have to sit on the floor until you move everything back to its original spot.